I have resisted watching this film for so long, mainly because I am not usually enthralled with movies about virtual reality (excepting The Matrix and Existenz) and also because I vaguely knew that this film diverged greatly from the Stephen King short story which provided the source inspiration. I gave in recently only because of my current fascination with the brief career of the gorgeous Jenny Wright. Unfortunately, as a fan of hers, this movie disappoints; and not unexpectedly, as a former fan of Stephen King’s books, this film disappoints as well. The Lawnmower Man tells the story of Dr. Angelo’s experiments with chemicals and virtual reality in an attempt to boost animal intelligence; he works under the funding of The Shop, the faceless government organization from much of King’s work (such as Firestarter), who don’t fail to see the military application of his research. It’s only when he applies his techniques on the local simpleton, Jobe, does his research bear unexpected and ultimately dangerous results. Clearly the writers took a great deal of liberty in adapting the short story. There is slight pleasure upon recognizing the only bit that remains from the book — when Jobe, in full-on psycho mode, telepathically sics his lawnmower on the abusive father of his friend, Peter — but otherwise, the entire story is original material. This movie is mostly about hubris and its consequences. Dr. Angelo believes he can bestow greater intelligence, but he is messing with forces beyond his control or understanding; and as Jobe gains intelligence and super-human powers, his attempts at taking on god-like powers results in his mental and physical break from his humanity. And within the trappings of a Greek tragedy, the movie incorporates religious undertones. Firstly, Jobe’s name explicitly recalls the character of Job from the Bible; Job was a simple man who is subjected to many difficult trials and pain. Also, Jobe first spots Marnie (Jenny Wright), a widower and seductress, while she eats an apple, and after gaining intelligence/knowledge, he becomes her lover; all of this foreshadows his impending downfall. There are others, but these are the more interesting examples. As far as the virtual world that is explored here, I’m sure at the time the effect may have been seen as advanced, but now it seems very quaint; computer effects are far more sophisticated than in 1992. Just look at The Lord of the Rings trilogy, or even John Adams, to see how far a computer generated world can take us into a false reality. 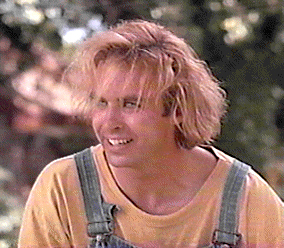 Jeff Fahey does a good job in portraying Jobe, but his early scenes just remind me of the recent Ben Stiller character, Simple Simon, in Tropic Thunder, and I kept thinking, “Don’t go full retard!” Jenny Wright is given short shrift for being billed as the female lead, given only four scenes where her character serves only to titillate. Pierce Brosnan is fine as the lead, but ultimately somewhat bland. And as far as Stephen King adaptations go, this movie only further proves that the successful adaptation of a short into a feature is a rare thing; stick with The Mist, Stand By Me or The Shawshank Redemption. Next up, and I promise, Ladies and Gentlemen, the Fabulous Stains. It really is a shame that she left her acting career behind, but with good roles seemingly behind her and possibly future roles along the lines of what is seen in The Lawnmower Man, I can only assume that a continued career in Hollywood would not be satisfying. Thanks for the comment.